Spelling and grammar? Check. Correct contact information? Check. No objective or “references upon request” line? Check. 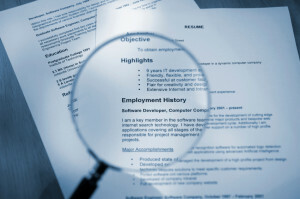 While these are a few of the common things you may look for as you’re working on your resume, there are some lesser known mistakes that could be plaguing you as well. They are things you may not have thought of or even realized you were doing. But when it comes to your resume, you want to make sure you’ve covered all of your bases and created as strong of a document as you can. Calling out the company’s achievements instead of your own. It can be helpful to give a little bit of background information about the company so the employer gets a better sense of where you were working, but remember that your resume should focus on what you’ve done. The company may have $2B in managed accounts, but how much of this do you contribute to? Avoid relying too much on the company’s reputation to get your foot in the door. You still need to show what you can do. What were you personally involved with that helped to grow the bottom line, cut costs, or improve customer service? Don’t forget to quantify results where possible. Presenting yourself as a follower instead of a leader. Take pride in your hard work and don’t be afraid to draw attention to your abilities. You may have been working as part of a team, but show how you made a difference. Did you supervise others? Delegate tasks? Spearhead the client presentation? It’s your resume and your time to shine. Don’t lie and take credit for others’ accomplishments, but also don’t downplay your own. Show that you are able to take initiative, come up with forward-thinking ideas, resolve problems, and get things done. Including too much information before your job experience. Your resume should start with a strong summary of qualifications that is between three and five sentences long, then move to core competencies, and then proceed to your experience. (Some job seekers may list education first if they’re recent graduates.) Taking up space by listing multiple achievements, breaking down your experience by area, or including too many other details can be a distraction. Emphasize your accomplishments within each role to give them context. Often times extra information at the top can be repetitive or forgotten once the employer actually gets to that job on your resume.